It’s that time of year when the early 2015 blockbusters get their first trailer released. This one is the family friendly, ex-wrestler, Dwayne Johnson. I would say that this one will be, at most a 12A as Dwayne seems to drop his wrestler nick-name, The Rock in child-friendly films. The best thing from the trailer is the music. The version of California Dreaming is very haunting and we will find out who sang it for you as I have no idea. I just hope the PR person knows. 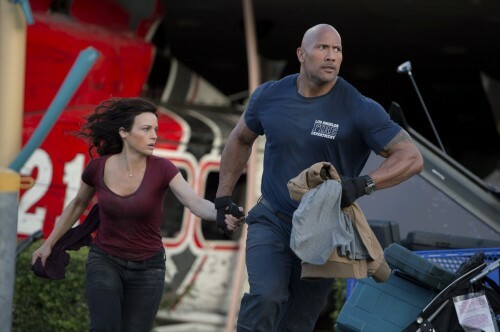 The rest is just a cliché ridden homage to disaster movie from the 70s with modern special effects. I’m sure that’s not what Warner Bros want to read but that’s how I feel. Read the below synopsis and try and count the clichés that are in the first paragraph. Estranged wife, tick. Disaster, tick. Child in trouble, make it more clinched, daughter, tick. With that, I wonder how the film will end. Even the trailer makes it look like a disaster movie by numbers. It could even be a remake of the 1974 Charles Heston film, Earthquake with a huge amount of the CGI from, the film, 2012.